Let me just clarify something for a minute. I DO NOT WANT TO ADMIT FALL IS COMING. 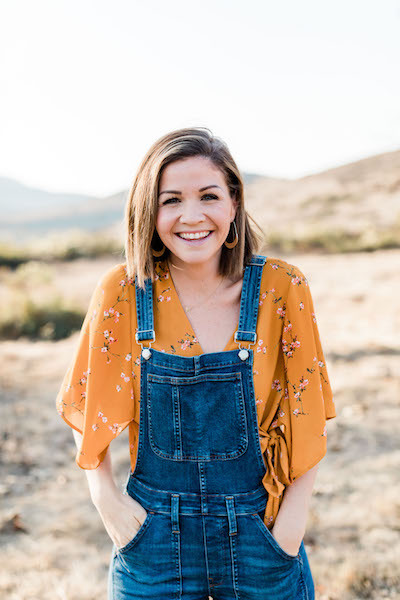 I know that everyone else is on the Fall bandwagon, but I just can't seem to believe that summer is yet coming to a close and I don't want to think about pumpkin spice latte's and boots with skinny jeans yet. In fact, my legs are feeling claustrophobic thinking about it. Let me keep my shorts and iced tea, pleaseandthanks. It's still summer in my book. That being said. Pinterest is a buzz with All Things Fall and the Bucket List has been requested to be updated with "2013", and so I just redid the whole header area--I think it's pretty cute. 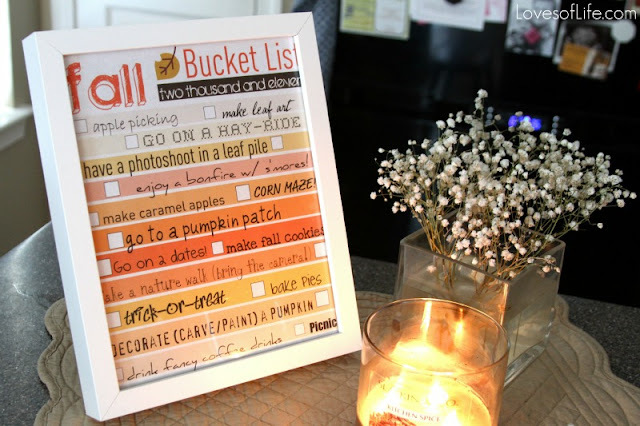 The idea behind this is to go to the printable page, download it, print it to your printer (should print as an 8x10), put it behind a glass frame, and then use a dry erase marker to check off the activities as you go. Old picture of first printable, but you get the idea. It's not used to MAKE SURE YOU DO EVERY ONE all religious and strict-like. It's more so, a guide. You're thinking, what should we do this weekend? Oh yea, let's put apple picking on the agenda. That'd be a great family memory. You know? But,you can still use it if you want. Find the printable here and enjoy. Do me a favor and if you PIN this one (so people can find the 2013 version), use the top picture in this post? Thanks. I do not get the whole rushing of fall. Because fall means winter. And, well, no thanks. Seeing the fall giddiness here and there makes me what to throat punch a kitten. I am still very much caught up in Summer and not looking forward to it ending. Shorter, darker days? No thanks. I will attempt to stretch summer well into October. Hoping the weather cooperates. That is awesome! I am going to have to print this and put it up!! Love all the ideas!! Love it! Pinterest is how I found your blog in the first place, and I have been enjoying it and your Instagram ever since :) If you ever come to Seattle, we should hang out! Great list! Have fun. Love how you framed it too. Thank you. I am not at all interested in Fall either. Partially because Fall means my baby turns one and isn't a baby anymore (except he's totally a baby until he starts walking in my book. You can't have a toddler who doesn't toddle) and partially because we've had such a cool summer that I haven't even felt like it was warm enough to go to the pool and sister wants to enjoy some rays before they're gone for months. Thanks! Love this. And hey, just ignore the depressing "must add my unwanted opinion types lol! 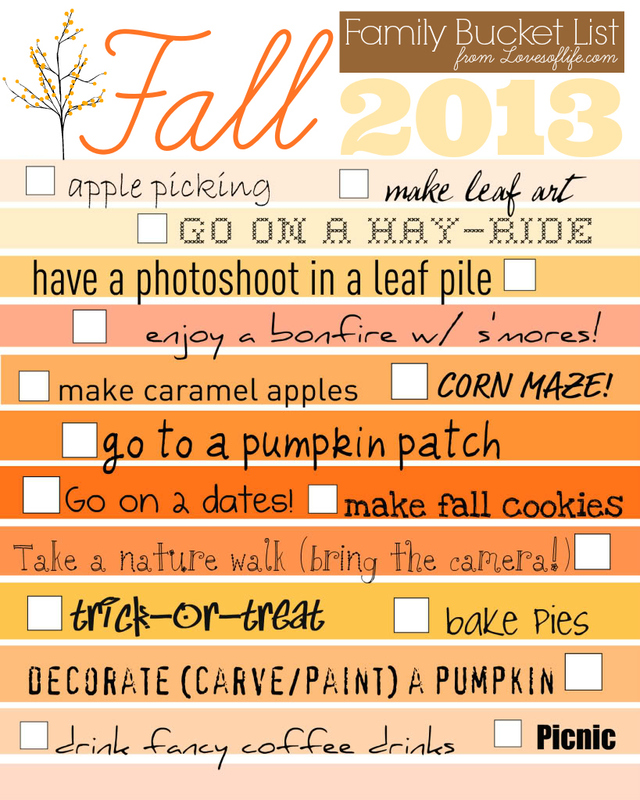 The rest of us adore the cooler temps and family fun that comes with fall! Hope you have a wonderful time fulfilling your bucket list! Thanks for the checklist! So cute! Is there a 2014 one?